Solid Brass Admiral's Sundial Compass w/ Rosewood Box 4"
The Hampton Nautical Admiral’s Compass is truly a great gift the distinguished nautical enthusiast in your life. This 4-inch diameter compass is a solid brass and features a solid brass shell and face. Press the push button to reveal the compass. The compass needle is accurate, quick and responsive. The cap can be closed at any time. There is a small lever on the side of either compass that operates a needle lift mechanism to protect the compass bearing. The compass rose is graduated in degrees and has a standard surveyor's 0 - 90 degree scale from North and South. The top of the compass has a swivel and collapsible sundial. 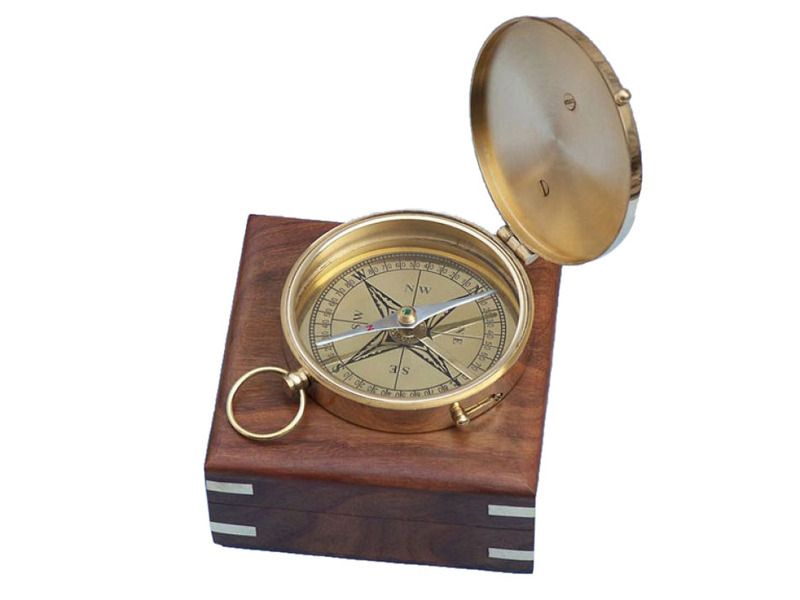 This solid brass compass comes with solid rosewood box that has the Hampton Nautical anchor with rope logo embedded into the top. The box is a smooth and polished finish wood with a green felt on the inside to protect the compass. The earliest basic sundials, from 3500 BC, predate the earliest nautical compass by almost 2500 years. While the Chinese began using the marine compass around 1122, under the Song and Yuan dynasties, the ancient Egyptians and Babylonians were learning to mark the sun’s movements. Around 1500 BC, during the reign of Thuthmose III in Egypt, the first shadow-clock used to mark time throughout the day was created. Using a simple T-shape, this device was placed to the East in the morning, so the sun’s shadow would be cast over the horizontally marked bar, and at noon was turned west, so the evening shadow would be cast along the same piece. Although it was very rudimentary, the markings on the horizontal bar were calibrated to coincide with the shrinking shadow, with notches farther apart for the times furthest from noon, and divided daylight into 12 parts for the first time. 200 years later the first round sundial, the shape that is commonly used even today, was introduced during the reign of Alexander the Great. Around this same time the Chinese diplomat Zhou Daguan used a nautical compass to navigate from Wenzhou to Angkor Thom thousands of miles away. Around1300 AD the first mechanical clocks were invented, though between 1500 and 1800 AD the sundial had its golden age. 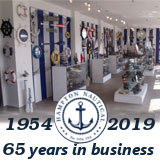 Becoming a staple of society, as well as an important nautical tool, the sundial was used with the nautical compass to accurately measure time at any given location. These brass compasses pair two of the most important nautical tools in history – one for finding time, the other for finding your way. Aboard ships both of these historic tools aided in seafaring for hundreds of years.